An invitation for overachievers to discover what it means to rest as God's daughters without compromising their God-given design as doers. 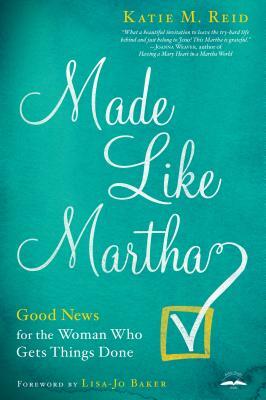 Though she didn't sit at Jesus's feet like her sister Mary, biblical Martha was loved just as she was--and you are too. This practical resource invites modern-day Marthas to sit down spiritually as they exchange try-hard striving for hope-filled freedom without abandoning their doer's heart in the process. Doers need to be affirmed in their innate design to do rather than sit, yet also be reminded that they don't have to overdo it in order to be worthy. This book is not an exhortation to add or subtract things off your to-do list, but it is an invitation to embrace the "good" of the Good News. Here is an offer to step into your position as a daughter of God and to enjoy life as a doer. KATIE M. REID is a firstborn overachiever and a modern-day Martha. As an avid blogger at katiemreid.com, Katie provides posts, articles, letters, and other resources for try-hard women on an ongoing basis. She encourages others to unwind in God's Presence--through her writing, as well as through her speaking--as they find grace in the unraveling life. Katie has published articles with Huffington Post, Focus on the Family, iBelieve, Crosswalk, MOPS, (in)courage, God-sized Dreams, Purposeful Faith, Inspiring Families, and many other websites. She is also a contributing writer for iBelieve.com and Lightworkers.com and has been syndicated on ForEveryMom.com. Katie is a devoted wife of a youth pastor and a homeschooling mother of five children, who resides in the middle of Michigan.